Connect to a GPS receiver (optional). Connect to an APRS data source. click the File menu and select Configure, then By Wizard. The Configure wizard dialog should appear. 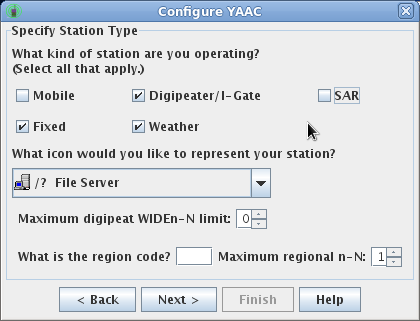 The wizard can also start automatically when you start YAAC if YAAC isn't configured yet. 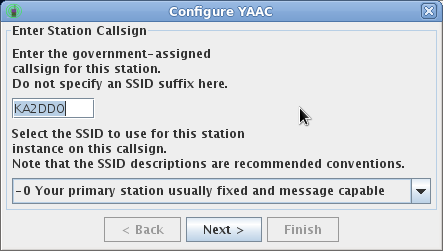 The Specify Station Callsign panel should appear in the wizard, with a field labeled "Callsign", with a default value of NOCALL. Replace NOCALL with your government-assigned callsign. Optionally specify an SSID suffix of 1 to 15 (default of -0 means no SSID suffix). For example, KA2DDO for the author's primary station, or KA2DDO-9 for his automobile. Select the type(s) of station you are operating (you can choose more than one if applicable), and the symbol with which you want your station displayed on other APRS clients. Also specify what region or section your station is operating in (so as to be able to use section-level digipeat aliases). Enter your station latitude and longitude. Even if this is for a mobile station, this provides a default when your GPS isn't working; specify the location where the mobile is normally parked in that case. Also specify whether you want an initial set of OpenStreetMap map data downloaded onto your computer while the configuration process is going on (you should only do this if you have an open connection to the Internet so the author's web site can be accessed to download the map tiles). 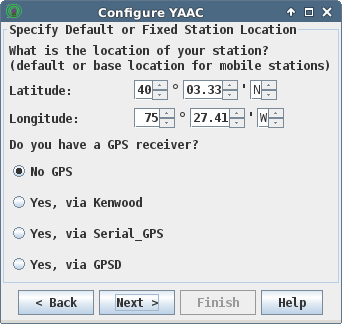 Then specify whether or not your station will be using a GPS and, if so, how it is connected (either through a serial port, as part of a Kenwood radio, or using the Unix GPSD daemon). If you specified using a GPS receiver, the next page will ask for your GPS parameters. Select the operating system specific device name corresponding to the serial port connected to the GPS receiver. This will be COMn (where n is a integer number) on Microsoft Windows, or /dev/ttySn or /dev/ttyUSBn on Linux or Mac OS X systems. If you do not see any device names in the device name drop-down, you are either using a connection unsupported by the RXTX communications library, or you do not have permission to access the device (check the privileges and/or Unix groups for your user account). Typically on Linux you will need to be a member of the "lock" group and "tty" or "dialout" group. NOTE: There is a "feature" in Fedora Core 15 Linux (and possibly some other distros) where device lock files have been moved to a directory not known to the RXTX library. See the Configuring Serial GPS Ports page for how to work around this. Set the baud rate to match the speed of data flowing in and out of the GPS's serial port. Normally, this will be 4800 baud, but some GPS receivers may be configured at a faster speed to allow more data records to be delivered per second. Click Next to save the changes and open the GPS receiver port. Specify the computer where the GPSD daemon is running. Usually, this will be the same computer as YAAC is running on, so you can leave the default of "localhost". Specify the TCP port number where the GPSD daemon is listening for location client connections. Unless NAT port forwarding with port remapping is in use or you have a non-standard GPSD installation, use the IANA-approved standard GPSD port number of 2947. The wizard will next display a list of APRS interface ports you have open (for a new installation of YAAC, this list will be empty). Click one of the buttons at the bottom to specify which type of APRS interface you are going to use. Note that you can have more than one port, especially if your station is going to be a cross-band digipeater and/or I-Gate system. For connecting to a radio/TNC combination, click the Add Serial KISS TNC button. A dialog box will appear, asking for setup parameters. Select a Port Type of Serial_TNC (if it not already set to this). Select the operating system specific device name corresponding to the serial port connected to the TNC. This will be COMn (where n is a integer number) on Microsoft Windows, or /dev/ttySn or /dev/ttyUSBn on Linux or Mac OS X systems. If you do not see any device names in the device name drop-down, you are either using a connection unsupported by the RXTX communications library, or you do not have permission to access the device (check the privileges and/or Unix groups for your user account). Typically on Linux you will need to be a member of the "lock" group and "tty" or "dialout" group. NOTE: There is a "feature" in Fedora Core 15 Linux (and possibly some other distros) where device lock files have been moved to a directory not known to the RXTX library. See the Configuring Serial TNC Ports page for how to work around this. Set the baud rate to match the speed of data flowing in and out of the TNC's serial port. Enter the callsign by which this TNC port will be known. This is important for multiple-TNC gatewaying digipeater installations, where each port needs a separate callsign-SSID combination. For a single-TNC deployment, use the same callsign as you entered on the Beacon tab (the wizard may automatically fill this in for you). Decide whether or not you want to be able to transmit through this port. Usually, specify Enabled unless you are not licensed or your jurisdiction does not permit unattended transmitters and this would be such a station. Specify which digipeat aliases your station should relay. You should only select TEMP1 unless you are deploying an intentional digipeater. Click Next to save the changes and open the TNC port. For connecting to a radio using a computer soundcard and a software TNC such as AGWPE, DireWolf, ldsped and soundmodem, or others compatible with AGWPE's TCP interface, click the Add AGWPE button. A dialog box will appear, asking for setup parameters. Select a Port Type of AGWPE (if it is not already selected). Specify where the software TNC is running. If you are running it on the same computer as YAAC, use "localhost" or "127.0.0.1" (the default), otherwise specify the domain name or numeric IP address of the other computer. Specify the port number that the software TNC is accepting client connections on. Note that YAAC assumes AGWPE (or emulators thereof) to be on the standard TCP port number of 8000; you will have to adjust the port number if you are running the software TNC on a non-standard port number. Specify the name of the TNC instance within AGWPE that you plan to use. AGWPE and some of its emulations support more than one logical TNC within the same server instance; the port name will be the same as the name displayed by the AGWPE setup program. Click Next to save the changes and open the AGWPE port. For connecting to the APRS-IS backbone, click the Add APRS-IS Connection or Add SSL-APRS-IS Connection button. A dialog box will appear, asking for setup parameters. Select a Port Type of APRS-IS or SSL-APRS-IS (if it is not already selected). Select which APRS-IS server you should connect to. Normal users should connect to the load-balancing Internet alias for their continent of the planet, for example noam.aprs2.net for North America, aunz.aprs2.net for Australia or New Zealand, etc. The wizard will make a good-faith guess which server to connect to, based on your station latitude and longitude. SSL users who have a ARRL Logbook Of The World digital certificate should specify ssl.aprs2.net. However, if you need to connect to some other station, you may type its name in place of the default server host name. Select which port on the server to connect to. Normal users should use port 14850 (which supports filtering), and SSL users should use port 24580. For non-SSL connections, enter your assigned passcode and select Enabled for Transmit if you want to send data into the APRS-IS from your station. Note you can leave the passcode blank if you only want to receive from APRS-IS and not transmit to it. SSL users will have the YAAC keystore automatically searched for their LotW certificate. specify an APRS-IS server filter expression of what data to receive from APRS-IS. By default, if you leave this blank and you are not configured for transmitting, a filter for 80 km around your station's configured latitude/longitude will be used automatically. If you have not configured your station latitude and longitude (see step 1. (d)), a circle around the city of Baltimore, Maryland, United States, will be used instead. Click Next to save the changes and open the APRS-IS connection. For connecting to a Peet Bros (or compatible) weather station, click the Add Weather Station button. A dialog box will appear, asking for setup parameters. Select a Port Type of Serial_Weather (if it is not already selected). If you want to use some other make of weather station that does not speak Peet Bros. serial protocol but does support the WXNOW.TXT file format, you will have to configure that through the expert-mode configuration dialog. 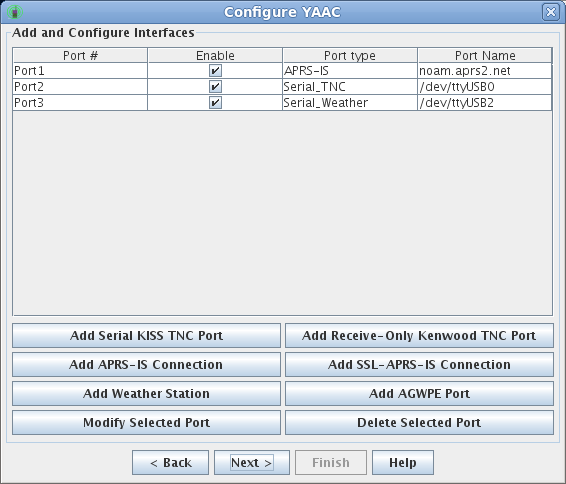 Select the operating system specific device name corresponding to the serial port connected to the weather station. This will be COMn (where n is a integer number) on Microsoft Windows, or /dev/ttySn or /dev/ttyUSBn on Linux or Mac OS X systems. If you do not see any device names in the device name drop-down, you are either using a connection unsupported by the RXTX communications library, or you do not have permission to access the device (check the privileges and/or Unix groups for your user account). Typically on Linux you will need to be a member of the "lock" group and "tty" or "dialout" group. NOTE: There is a "feature" in Fedora Core 15 Linux (and possibly some other distros) where device lock files have been moved to a directory not known to the RXTX library. See the Configuring Serial Weather Station Ports page for how to work around this. Set the baud rate to match the speed of data flowing in from the weather station's serial port. If you need to add any more ports, repeat the previous steps. Otherwise, click the Next button. Finish specifying the basic information for your station's beacon message. Some parts of the beacon were collected from other information on earlier wizard screens. Add the remaining information for your position beacon message here. Then click the Finish button. Downloading the raw OSM map data from https://planet.OpenStreetMap.org or a mirror site such as http://download.geofabrik.de/, using the web browser of your choice. Assistance for selecting a mirror site is available with the File->OpenStreetMap->Download OpenStreetMap Extract Dataset menu choice. Import the downloaded OSM map data into YAAC. or selecting the File->OpenStreetMap->Download Precompiled Tiles menu choice to download already-imported OpenStreetMap data from the YAAC author's website to your system. You can also download topographic (elevation) data from the U.S. Geological Survey by selecting the File->Topographic->Download Tiles menu choice. Note that this data is for worldwide landmasses (not just the United States), and is available to any user whose nation is permitted Internet access to the United States. Enjoy! At this point, YAAC should be receiving APRS data and plotting it on the map. You can use the various choices on the View menu to look at the data in other ways.